Planning for the new school year can be hectic, if not overwhelming! Everyone is worried about finding the latest and greatest school supplies and teacher resources. If you are currently facing this dilemma, I'd love to keep you afloat. I recommend pencils and a calendar as being the top two teacher tools you need this back to school season. Everything you think will happen, usually changes. The pencil will help you keep track of these many changes. If you have a calendar, you can map out where you want to take your students in the coming year! Yet again, the pencil will surely help you in this endeavor. Everything you plan, usually changes. Notice a pattern here! If you are ready to plan out the best school year ever and learn the secrets of creating a dynamic pacing guide, this blog post is for you! Prepare for creating a curriculum plan by gathering materials first. 3. Use a calendar (you can print a simple monthly calendar for the school months off of the Internet or use a calendar from a Dollar store) to mark all of the holidays and special days in the school year that your students will NOT receive instruction. These dates will impact your teaching time, so it essential to account for how much time you will actually have this school year! You can use a highlighter to mark out non-instructional days or cross them off. Make sure you pencil in all of the end of the reporting or grading periods and semesters. This will help you stay on track with your pacing as you plan out your school year. Account for all of your instructional time per month. 5. Take the standards and/or scope and sequence documents for each individual subject. Working through this process takes time and attention. Start with one subject area. Since I focus on math, I will provide an example for math. Using the state standards for math, I know that in kindergarten I need to work through the numbers 0 through 20. In order to promote mastery, I need to break up those numbers in groups. I will not teach all of the numbers in September, but focus solely on numbers 0 to 5. Now, looking at the calendar, I know that I have 18.5 days in this month to teach my students how to represent numbers 0 to 5, generate sets with numbers 0 to 5, and compose and decompose numbers 0 to 5. As a novice, you will rely on basic division to give you the pacing for this month. You will probably not know what topics will give your students the most difficulty, but you can plan in time to help remediate students. For example, 18.5 days divided by three topics is about five. I can spend five days for each of the topics. Then, I will have four days for review, assessment, and remediation. If I have three focus topics (based on the standards) that need to be covered and 18.5 days to cover them (based on the instructional days on the calendar), I could spend five days on each topic and have four days of built-in time for assessment and re-teaching. These days can be called "flex days" on your calendar. The flex days can be used if a topic needs more than five days devoted to it, or if you need to re-teach a portion of the students in the classroom. As an experienced teacher in this grade level, I know that composing and decomposing numbers will be most difficult, so I anticipating using at least one of the "flex days" for intervention on this topic. Color code your curriculum calendar based on subject areas. school curriculum: What resources do you have access to? Is there anything you are required to use to teach a particular subject? school learning philosophies: Is your campus implementing a particular approach to teaching? Many of these topics will be taken into consideration as you build your daily and weekly lesson plans, but I would be amiss without mentioning these! 7. Repeat the process for the entire school year, for each individual subject. Personally, I like to work through one subject at a time. It helps me to stay in the same mindset while planning out the subject area. I tend to work in chunks of time devoted to each subject area and find that, for me, it is beneficial and the most efficient use of my time. Some teachers prefer to work through each subject within a grading period. Then, they move to the next grading period. Whatever strategy helps you, commit to it and use it! Regardless of your method, I recommend completing this task for the entire school year, before the school year begins. You can alter your plan during the school year, but it is harder to make time for this practice and it is not as effective building your big picture plan as you go. This process will help you create a significant planning tool for your classroom or grade-level. This procedure allows to you examine and organize your school year. 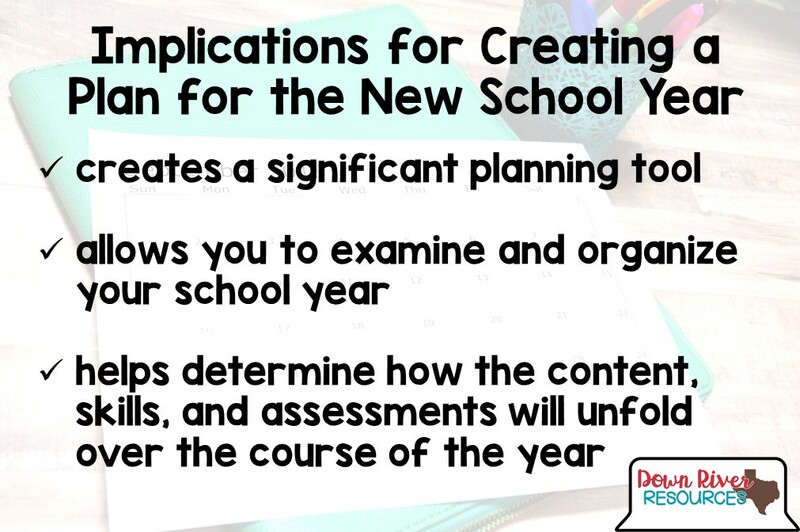 It allows you, as the educator, to determine how the content, skills, and assessments will unfold over the course of the year. I am in a grade level that takes a state assessment, prior to the end of the school year. How do I plan for this? You want to plan out all of your tested standards so that you cover them before the testing window. I like to plan to have everything taught at least two weeks in advance of the testing window. If I can teach everything before this time, this allows me two solid weeks of review. This review time is critical for students to recall older information and set the tone for testing! What if I do not have any direction on curriculum pacing? Use the standards as your guide. If you have 36 standards to cover in a particular subject, cover one standard per week. If you have 36 standards to cover and need to cover them before a testing window, count up your instructional days BEFORE the assessment, and teach all of the standards prior to your testing window! What if I already have a pacing guide? If you already have a pacing guide, you are one step ahead in this process! I still recommend working on your calendar and breaking up the units or topics into the specific days accounting for all of the instructional time that you will have based on the calendar you created in step three above. What if I own a Down River Resources' TEKS pacing guide? I did a lot of the pacing for you! I have already broke all of the standards into groups based on months of the year. If you are in a grade level that takes the state assessment, I took this into consideration while mapping out the standards by month. Using the prepared pacing guide effectively still requires you to break down the recommended standards by month into instructional days based on the calendar you created in step three above. Because student groups and instructional calendars vary from district to district, it is impossible for me to have a universal guide for this! I hope this post inspires you to create a plan for your best year ever and if you'd like to use my TEKS pacing guides to help you along this process, you can find them in my TpT shop. What resources are available to you to create your plan for the new school year?